In performance testing, it is really important to simulate a realistic user path through an application. For example, randomly select an image link from a gallery or select a share from a share list. In such situations, you can use the LoadRunner lr_paramarr_random function to select a random value from a captured parameter array. Similarly, you can also write a code to do the same. Before you use the above function, you will need to use web_reg_save_param function to capture all the ordinal values. This can be achieved by passing "ORD=ALL" into the function. The following code demonstrates the use of lr_paramarr_random function. 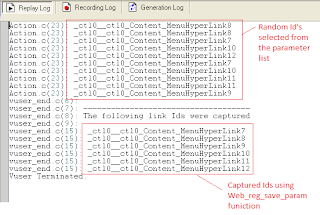 The code saves link Ids using web_reg_save_param function and then uses lr_paramarr_random function to randomly select an Id value. The value is passed as a parameter in web_text_link function to navigate to the appropriate webpage. 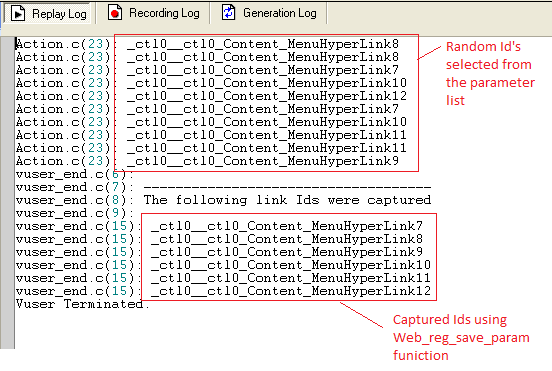 Following is a screenshot of replay log, displaying the random id's selected for each iteration. It also displays the values captured using web_reg_save_param function.